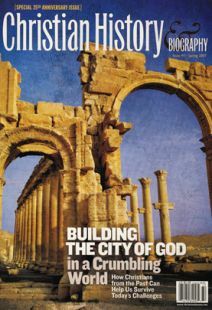 Twenty-five years and 94 issues later, Christian History & Biography still strives (as our mission statement says) “to explore the Christian heritage in a nonsectarian and warm-hearted spirit.” We firmly believe that we’re not just providing intellectual food for history buffs; we’re giving Christians theological tools and historical models for wisely thinking and acting in the present. In short, the church cannot move forward into the future without listening to those who came before us. But the leap from “Hmm, that’s interesting and helps me understand our heritage better” to “This will change the way I think, worship, and act today” is not an easy one for many people. How often, in contemporary moral debates, do Christians refer to the past 2000 years for help in facing the current situation? For our 25th anniversary issue, we wanted to take a sample of modern problems and historical figures and show how this could happen. We e-mailed scholars and long-time friends of the magazine and asked them to nominate one or more people from church history from whom they believed we have the most to learn in order to face certain pressing challenges in the 21st century. The open-ended invitation sparked a fascinating online conversation as suggestions poured in—proving to us that this is indeed a vital question for Christians today. Will we settle for collective amnesia, or will we take seriously the fact that being part of the body of Christ means acknowledging the whole body of Christ—across cultures, across denominations, across centuries? We are saving many of these wonderful suggestions for future issues. The current issue represents only a small selection—a sampler box of chocolates to tempt the palate—focusing primarily on our social responsibilities in a fallen world. There are many more Christians from history who give us principles or models that we can carry with us into the coming century, and that’s why we exist as a magazine: to introduce you to these spiritual ancestors. The articles that follow include a wide range of perspectives—both on the part of the authors and the people they are writing about. How can history inform our lives today? It’s worth talking about for another 25 years, at least.